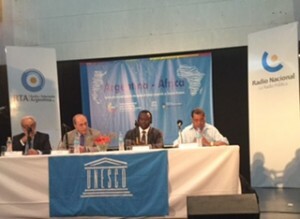 BUENOS AIRES, ARGENTINA – On April 27 and 28, 2015, the International Centre for the Promotion of Human Rights (CIPDH), in collaboration with UNESCO, held a seminar at Radio Nacional Auditorium titled, “Genocide and War Crimes: Challenges for International Justice in Light of Special Courts for Africa.” Focusing on the International Criminal Tribunal for Rwanda (ICTW) and the Special Court for Sierra Leone (SCSL), the seminar explored post-conflict experiences in the African context and examined how the international criminal jurisdictions operating Africa can achieve greater effectiveness in the future. The conference participants recognized that the work of international and national jurisdictions over genocide and war crimes—much as they are very necessary—tend to be very limited to effectively handle the magnitude and scale of these crimes at communal, social and political levels. It therefore becomes necessary to: a) encourage regional, national and communal justice and reconciliation institutions and processes to compliment international effort towards justice; and, b) prioritize investment in the prevention of genocide and war crimes. The event was the fourth activity in the series, “Argentina-Africa: Contributions for the Development of a Shared Work Plan Agenda on Human Rights,” launched in 2014 by the CIPDH. For more information, please contact Dr. Sentongo or read UNESCO’s full event summary.